Milton, Ontario - The Transfiguration of our Lord, the Slava of the Monastery in Milton, the diocesan see, was this year once again solemnly celebrated. The pre-festal joy was felt, which brought about a great number of guests from different parts of Ontario. On the eve of the feast the Vigil was served with the five loaves, officiated by His Grace Bishop Georgije of Canada, concelebrated by Iguman Vasilije, Protonamesnik Goran Gojkovic, Deacons Stefan Ikonomovsky and Damjan Radijic. 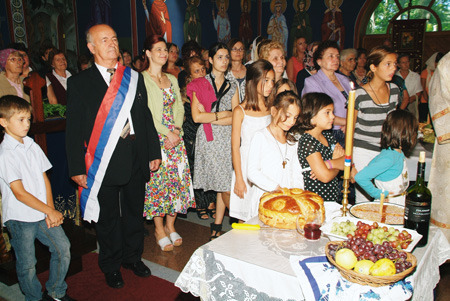 Afterward, everyone was welcomed to a meal prepared by the members of the Monastery Kolo Sestara. 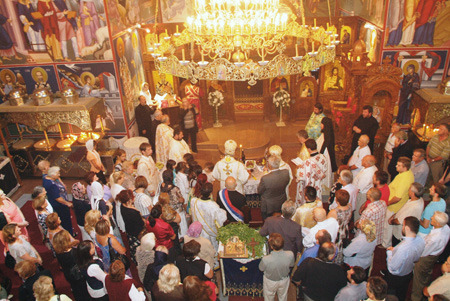 Many faithful were present on the following day when the festive Holy Hierarchical Divine Liturgy was served, officiated by His Grace Bishop Christophoros of the Greek Church, with the concelebration of the host hierarch Bishop Georgije and many clergy of the Canadian diocese. Bishop Christophor delivered an inspiring homily following the gospel reading about the feast of the Transfiguration, at which time he, on behalf of Metropolitan Sotirios, to whom he serves as vicar bishop, congratulated us on our Monastery Slava, beginning with Bishop Georgije, Fr. Vasilije the monastery abbot and all the honorable people. Following the Prayer before the Ambon a Litiya was served, going three times around the church with the reading of the Gospels and sprinking of the holy water. Everyone prayed for the Serbian Patriarch Irinej, Bishop Georgije, Iguman Vasilije and his brotherhood, and for all the faithful of Milton and neighboring cities as well as all deceased founders and benefactors of this holy house who have fallen asleep in the Lord with faith in the resurrection and life eternal. 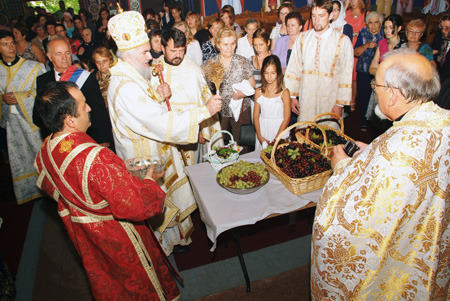 Having returned to the church the grapes were blessed and the Slava kolach with this year's kum Milorad Skakavac. Simo Rogan, with his family, at this time took upon himself the duties of kum for the following year. At the very end the host hierarch Bishop Georgije congratulated everyone on their Monastery Slava, wishing that for many years they celebrate in good health and prosperity. 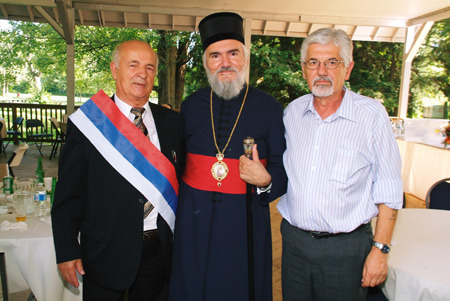 His Grace also thanked Bishop Christophoros for his brotherly love in taking time out of his schedule to be with us and among us; then the bishop welcomed everyone to the monastery pavilion for the Slava luncheon.